I’ve measured the speed of those creatures, and on average they gained about 271 units/min. 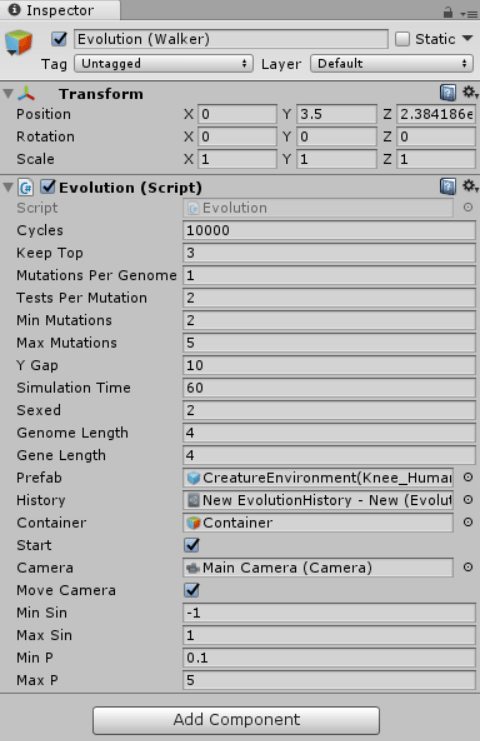 Also, as you can see, the creature is very stable, and moves are dynamic. When the creature is very close to falling, it stops and arranges its limbs and body, so it doesn’t happen. Then, continues on walking. You can clearly see the difference with the model trained by ML-Agents. The creature has taken a much more stable and safe position where the body is close to the ground, preventing unstable behavior. The steps are also very short. In the end, I wanted to make an experiment where falling wouldn’t be punished. The agent could move in any way, where originally falling restarted the simulation. This is a result of training the agent with ML-Agents. The agent’s average speed is 145 units/min. Evolutionary programming algorithm managed to make an agent move at the speed of 820 units/min. But, it’s hard to call this “walking”. So, obviously, looking at the results, you could say ML-Agents’ model of walking is way more natural and good looking. Yes, it is! Although, it takes time to train, you’ll get much better and stable result by using neural networks in such tasks. In this project the creature was trained on a plain terrain, which simplified the task for both algorithms. But it’s certain, that evolutionary programming could not compete with Reinforcement learning in more difficult tasks. Also, the experiment was done using 2D environment. Making it 3D, would extremely complicate training for evolutionary walking or make it impossible at all. ML-Agents is a great plugin that allows developers to create AI on the level which was impossible before, or at least simplify the process of its development. It’s really great to see Unity catching up to such things making such advanced tools easy to use.